Abstract The independent medical exam (IME) was designed to reel in over-utilization and monitor doctors’ billing practices so that fair and equitable payments are made for services rendered. The IME phenomenon has spread from the chiropractic arena to the medical and physical therapy worlds. While this trend is a good and reasonable way to monitor doctors and their billing practices, regrettably, some doctors have gone too far, inhibiting good practices and denying needy patients the care they require. This article describes proven techniques for appropriate file documentation. These techniques, together with several additional strategies, are effective in rebutting and dismantling specious independent examiners (IEs) (for the sake of this article this term includes all examiners, regardless of discipline) and peer review reports (review of case file only). This article also demonstrates how to uncover fraud in an industry that was originally designed to thwart unscrupulous chiropractic and medical practices. 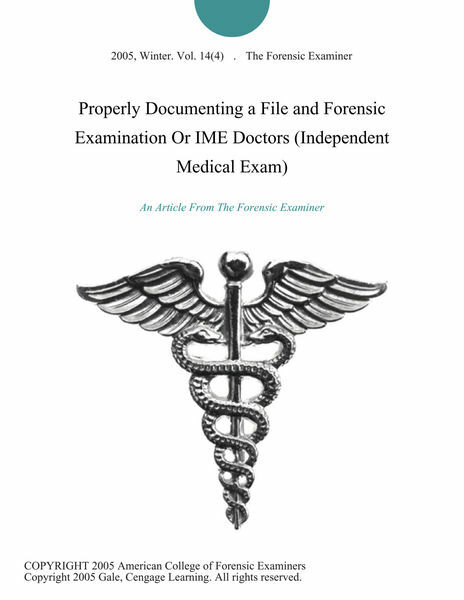 Doctors, Documenting, Exam, Examination, File, forensic, IME, Independent, Medical, Properly permalink.